Can illumination get any better than this? The anodized light gold finish blends in perfectly with the gold tones selected by interior designer, Aleem Kassam of Kalu Interiors in an upscale downtown Vancouver Condo project. Mounted on a stone side table, the lamp becomes a sculptural piece of art. Olah reveals the depths of refinement. Conceived from Karice’s award-winning creations, Olah takes aesthetic inspiration from a previously designed wall sconce to bring a new luminaire to life. The new table lamp marries technological innovation with sleek and sophisticated design. Like its predecessor (Olah Wall Sconce), the Olah table lamp illuminates on a ring without visible fasteners, giving a clean finished aesthetic. 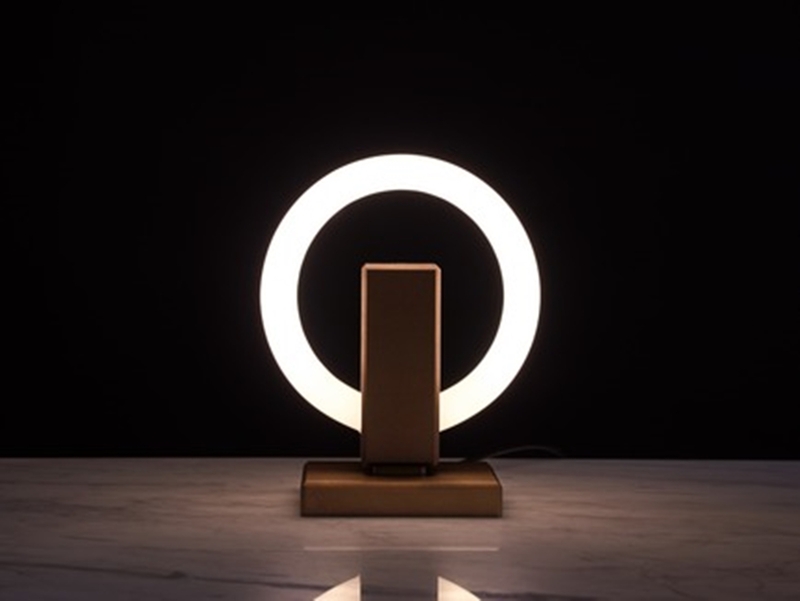 The light was conceived, created, and crafted by Maurice Dery and his team at Karice Enterprises. Bringing even the most ambitious vision to light, British Columbia-based Karice Enterprises has enormous passion for creating beautiful lighting products, pushing creative boundaries to craft the unimaginable with their cutting-edge, custom lights. Founder, Maurice Laurent Dery believes aesthetic beauty is the by-product of intelligent design and dreaming up what has never been done before is just a part of daily life at Karice. Following a minimalist approach, Karice strives to refine their products to be as simple and efficient as possible. Each piece follows this passion for doing the seemingly “impossible”, and reflects a creative, practical solution to a complicated design challenge. While their focus is collaboration on custom projects, in 2014 Karice began designing their own product line and now carry 30 unique products designed and manufactured at their plant in Surrey, Canada. Their recent lighting fixture releases are the result of new innovative designs curated by lighting designer Maurice Laurent Dery. What sets Karice apart from the competition is their state-of-the-art lighting and metal work facility. This allows them to specialize in artisan manufacturing; making prototypes, drawings, and concepts and creating one-of-a-kind masterpieces. Copyright © Enabled 2019. All Rights Reserved.